Ethnic OTT IPTV Solution - MatrixStream Technologies, Inc. Provider is a content provider from a South East Asia country. The provider would like to make content available to his ethnic community in the USA. He would like to stream 30 channels from his home country to the USA as well as 2,000 different movies. He would like to allow people to watch his content over the Internet in the USA. He will charge each subscriber a monthly fee for his service. In addition, he will offer VOD content as part of the package as well as some PPV content. HD Video – Customer would like to offer streaming HD content to premium customers. The ability to watch HD content would ensure the IPTV equipment would stay up-to-date with other IPTV technology advances. In addition, it will allow people who install HD video displays in car to watch HD streaming videos right over wireless IP. 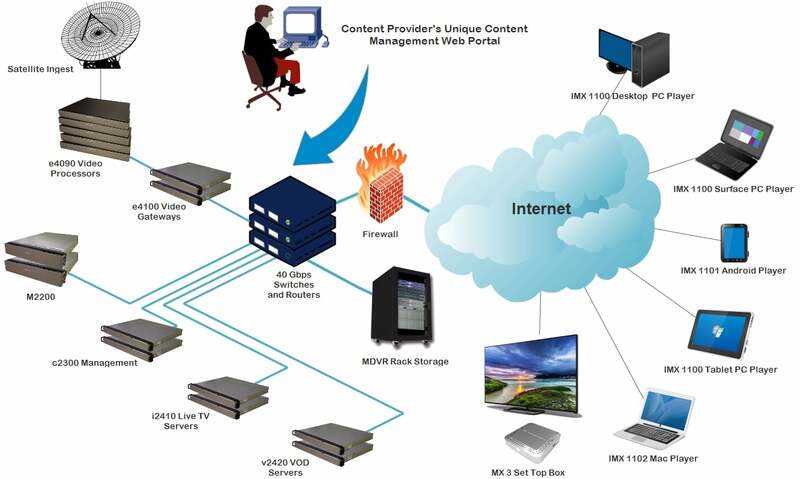 Streaming Over the Internet – Customer would like to use the Internet as their video transport. Customer is not impressed with some of the existing video downloading services due to poor video quality and slow video loading. Customer would like to use existing wireless broadband to stream videos vs. building one from scratch. As wireless technologies like WiMAX and broadband Cellular develop, customer would like to take advantage of higher access speed to stream HD content directly to cars equipped with WiMAX receivers. Dynamic Wireless Tower Switching (DWTS) – MatrixStream auto vehicle IPTV solution is able to maintain video quality even when wireless connections switch from one wireless tower to another. MatrixStream’s MatrixCast video transport is able to handle all the issues that come with wireless tower switching that’s common in wireless data networks. View HD Videos Inside Car Video Display – Customer would like to give subscribers the option to watch videos on their car video display. This means the player must be able to play on existing mobile video displays. Remote software/firmware update – Customer would like a system that has minimal truck roll. They would like to remotely manage all the car IPTV viewing clients. VOD Support – In addition to be able to watch live TV streaming to the car, customer would like to allow subscribers the ability to watch any of the videos available in the video on demand section. This essentially allow viewers complete access to the entire video library. Viewing Ratio – Customer anticipates that at any given time, at least 10% of its subscribers will be watching videos simultaneously. 2 IMX M2200 IPTV middleware servers. 1 for management and another for redundancy. 6 IMX v2420 VOD MatrixCast Streaming servers to support VOD. 6 IMX v2420 can support up to 6,000 simultaneous SD streams. At the same time, each server can back up the other through N+1 clustering design.